Sometimes we have to look for the small examples of humanity towards our fellow man. Lord knows the search is difficult by the standards of today's headlines. But I have found two small gems that I hope will provide a glimmer of hope in these lamentable days. 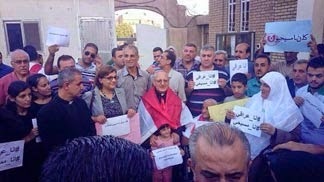 The first is a report by Breitbart.com that approximately 200 Muslims joined in solidarity with their Christian countrymen in Baghdad during a demonstration to protest the persecution of Christians by ISIS, the jihadist militant army. They gathered in front of a Catholic church to support those Christians who had been driven out of the city of Mosul, and for all those still residing in violent areas of the country. Muslims & Christians hold signs that say, "We are all Christians"
Muslim citizens stood side-by-side with Christians, both groups carrying signs that read, "I am Iraqi, I am Christian." According to Breitbart, "Some [Muslims] even marked themselves with the Arabic letter "N" for "Nazarene," or Christian. The letter has been used by ISIS in Mosul to tag homes in which Christians lived; homes later looted and used as ISIS property. The situation has been described as among the worst in the history of Christianity." And perhaps the most discouraging aspect of this entire story is the statement, "It is currently believed that Mosul is completely devoid of Christians for the first time in the history of the religion." But this story gives us hope that mankind still has a semblance of grace in our character. The New York Times reports that Christians and Muslims also attended church services together in Baghdad. Muslim supporters encouraged Christians: "You are the true original people here, and we are sorry for what has been done to you in the name of Islam." Oh, how I wish that sentiment would carry throughout their land! Perhaps the best bit of news that I can pass along is this: "The resistance to ISIS across Iraq by civilians in areas like Baghdad has become increasingly vocal. Even in Mosul, ISIS-painted letter "N"s have been "vandalized" to now read, "We are all Christians," in opposition to the group." That is encouraging, indeed! When the people can recognize that violence and evil against one group, represents violence and evil against all mankind, then the best of who we are comes to the forefront. The second story comes to us from the Israeli newspaper, Haaretz. Staff Sgt. 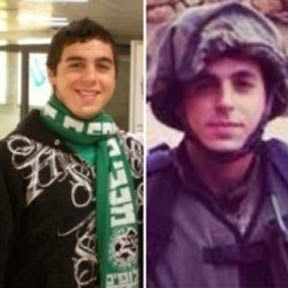 Nissim Sean Carmeli, an American-Israeli soldier from South Texas, was killed in fighting near the Gaza. Apparently, he was a true son of both countries. The paper reported, "He was the son of Israeli parents who had moved to Texas years ago and over the past few years had been dividing their time between the United States and Israel. His two sisters live permanently in Israel, as does his large extended family. He had attended Ostrovski High School in the central city of Ra’anana since he was 16, and he had numerous friends." Sgt. Carmeli could have taken an exemption from serving in the Israeli Defense Forces, but stepped up to serve his ancestor's homeland. Haaretz also mentioned that he was "a passionate supporter of the Maccabi Haifa soccer team and attended games whenever he could." So, the nation of Israel, concerned that there would be few people to attend his funeral, gathered together and urged each other to honor this soldier. Social media sites carried messages like this: "Come and pay final respects to a hero who died so that we can live. It’s the least we can do for him and for our people." The soccer team, members of the Israeli Scout movement, bikers, thousands of fellow soldiers, and individuals who were simply moved by this young man, all came to pay their respects. It is estimated that over 20,000 people came to the funeral. “Maybe because we didn’t know him, he represents everything – he is everyone’s son, everyone’s brother. Being here is a way to express the fear that we all feel that it could be any one of our loved ones who could die, in the army or in a missile attack." Regardless of the reasons that people attended, this is a heartwarming story of loyalty, respect, and honor. In a time of war, death is never celebrated. But in this instance, one young man's love for the Land of Israel brought thousands together to celebrate the life he sacrificed. What a legacy! So I am still optimistic about the human race; even amid the negative and depressing news that bombards us each day. Whenever and wherever we can share the love that God commands and intends for us to give, then it is a good day. These stories show us that we don't have to be enemies or hate each other because we are different; and a single person can connect us to the Spirit of God that is in each of us. I am hopeful and confident for the first time in a long while. Do you know of a fund that is set up so that we can help our fellow Christians in need? ?